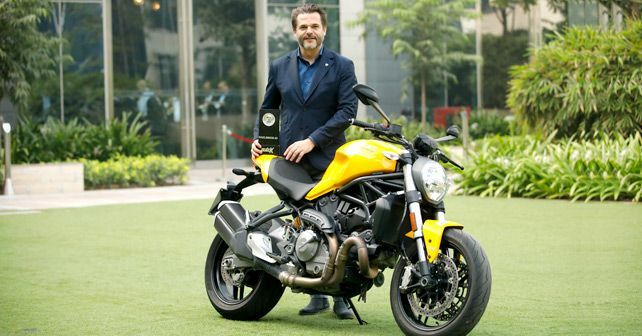 The Ducati Monster 821 is our 2018 performance bike of the year, which clocked the fastest two-wheel lap time at the BIC. Of course, with Ducati’s handling prowess and engineering this isn’t exactly surprising. In short, the new Monster 821 considerably benefits from some trickle-down engineering from its big brother – the Monster 1200. It gets a host of new design touches, such as a new tank, tail section, headlight and muffler. Then there is Ducati’s Testastretta, L-twin powerplant that offers incredible performance – pumping out 109bhp, which means that the Monster is capable of superbike performance. And it can shift personalities, thanks to the different riding modes. The new Monster 821 is certainly the epitome of what a naked sports bike should be. It’s muscular, and yet lean. It has no excess weight from unnecessary equipment. Its front-end is nice and beefy, which, together with its exposed Trellis frame and tiny tail, give it a powerful look and accentuate its aggressive nature. Besides being the fastest on the track, the Monster is also a practical machine that’s exciting on the road and impressive in its design. It’s a user-friendly package suitable for entry-level riders, but, at the same time, also offers engaging and tantalising performance to seasoned riders.